Adding DYMO LabelWriter 400 as network printer on DYMO Label 8.3 | ..:: JOCHEN HEBBRECHT ::.. So, we have been using the LabelWriter 400 for a long time as network printer in combination of DYMO Label 7.6. But as of version 8.3, we were not able to connect to the network printer. When I installed the latest version, it never asked me where my network printer was (it asked me in the 7.6 version!). This program requires a Dymo Printer. Please reinstall your printer driver. After clicking OK, the program immediately shutted down, so I was not able to configure a network printer. I'm having the same problem. The printer works fine if I'm printing anything that's not with the software, but when I try to use the software, I can't switch to the printer. I know I have remote access to the printer, because otherwise I wouldn't be able to print at all if I didn't. I've tried using the netbios name in order to access a computer, but it's not working for some reason. What could be the reason? The host I"m trying to access by the way is on a lan line, but the PC i'm using to call the host is on wireless. 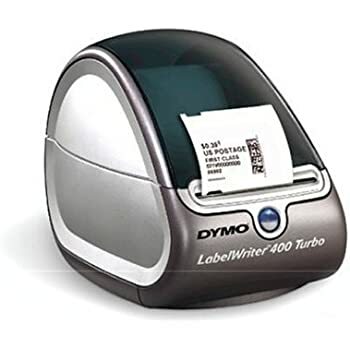 DYMO Label requires a DYMO label printer to be installed. Make sure your label printer is installed and connected. What can I do in order to get the software to recognize that I'm trying to use the printer remotely? I have the version 8.3.1.1332 of the software, and version 8.3.0.443 of the drivers. I am running on a Windows 7 64Bit OS. This has been a very troubling problem and I'd appreciate any sort of response to this email. so through a very annoying process of enabling netbios usage through my router (which was in an option way off in BFE on the interface), i tried what you suggested, and it worked. why in the world would this problem happen? THANK YOU SO MUCH for this...i called their tech support and they couldn't tell me a damn thing...this solved hours of troubleshooting. Had the same problem here! Fixed with your work around above... lets see if it still works in a few days. I can't have this happen all the time, as the staff can't keep using this work around. THANK YOU for this post! I've been pulling my hair out over this! I can't believe that this makes such a difference with the DYMO but I guess it does because your tip worked. THANK YOU! Did you follow the steps in this blogpost? This seems to be a windows problem. Great tip. In the past I could get this to work by installing a LocalPort that pointed to the printer share, but it seems in Win10 this no longer works. I have had this issue twice now (first time a few months back which required a software re-intall). However, I figured second time round that it must be something simple regarding some kind of update and there must be a simpler solution. - double-click "devices and printers"